Last night my check engine light came on. I was overdue by about a hundred miles (or about 2 months) for an oil change, so I thought it was time to go in and address both. I usually go to Midas in Palo Alto for my oil change, really for no other reason than habit. I had gone to Jiffy Lube until they had stripped my star shaped bolt on my old Cadillac - and had gone to Midas ever since. Well when I looked up Midas on yelp to get the phone number, the reviews were horrible. Thinking about my check engine light - I thought that I should look for a place with better reviews (I know very little about cars and wanted someplace more reputable). 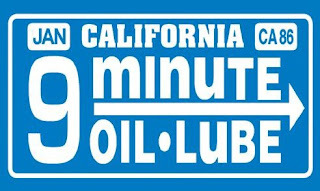 Enter 9 Minute Oil & Lube. They have AMAZING yelp and google reviews, so I thought I would check it out this morning. This year for Christmas, my sister and I got my mom 4 teacups and saucers in the pattern she wanted to register for when she got married: Pembroke by Coalport. 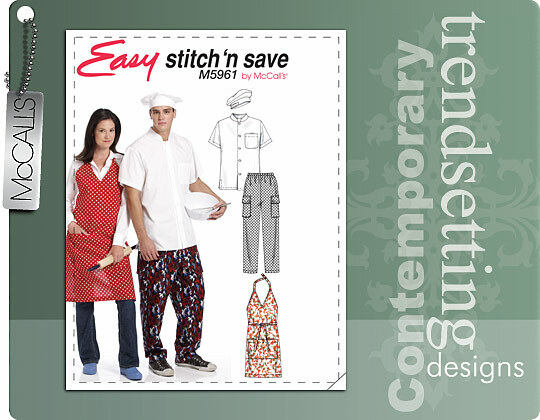 She said it was a very popular pattern in the late 70s and early 80s. 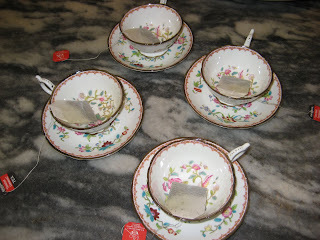 Here are the 4 teacups in action - very delicate and pretty. Instead of registering for Pembroke, when my parents got married they registered for the same china pattern as my grandparents - Vine by Royal Crown Derby. 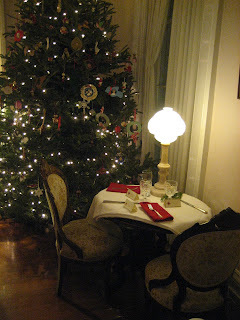 I think that it is very beautiful and classic - the gold glows in candlelight. Speaking of my grandparents, my grandmother collected interesting china pieces - including this soup tureen now on display at my Aunt and Uncle's house. 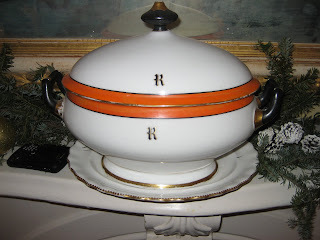 I would love to know what pattern this is, or what style china - I love the orange band! The "R" is also really pretty. Anyone know what this is? So after all this talk of china, you might wonder what we registered for. We have registered for Republic from Lenox. I really like this pattern because it is gold and the pattern is not too simple or too busy (and I love the little red dots). 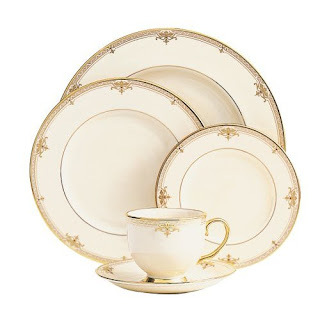 I would have posted photos of my future-in-law's china, but I don't have any! (I also don't know the name of it either)! They have beautiful china as well. 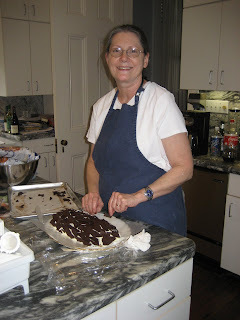 Last year my mom outdid herself by making a homemade chocolate Buche de Noel cake. 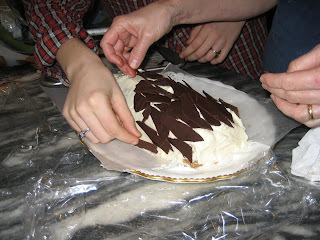 It was a combination of several recipes and even had a cut branch section in the middle! Impressive and delicious. Well this year she decided to try something new and pulled out a saved Martha Stewart recipe (can you tell Martha love runs in the family?). 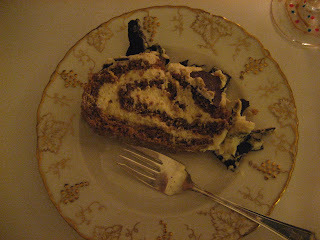 From the December 2003 issue of Living, the recipe is called Walnut Orange Buche de Noel. Last year's cake featured a faux bois, this year's cake was decorated with chocolate bark. This year's recipe was my favorite - it tasted amazing! Can you believe that the entire cake only contains 2 tablespoons of flour? Here is a picture of my piece on my parent's wedding china. What will she think of next year? Can't wait to find out! Every year my mom makes gingerbread houses for the little kids to decorate. When we were little she would make 12 - one for each kid and a friend. This year it was just my sweet little niece (with the help of her mom and two eager aunts). 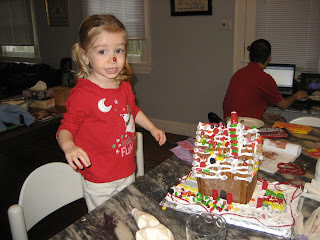 Anyway, usually she makes it from really hard gingerbread in a cast iron mold and assembles it with royal icing. However, this year she decided to follow a recipe in the Martha Stewart 2009 Holiday cooking special edition of her magazine. 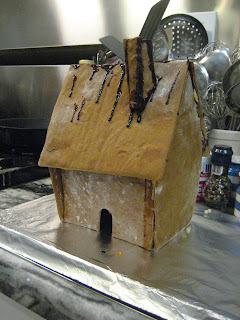 It is a Swedish Gingerbread House held together with melted sugar instead of icing. Here is the house after it was assembled. The melted sugar was HOT and we let it sort of burn toward the end (thus the dark color). Looks pretty good and felt sturdy. Here is the house the following morning. I should note that there is VERY high humidity here now (lots of rain). 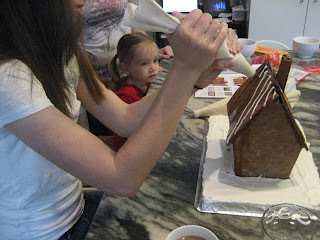 The sugar holding the house together has started to soften and soak into the gingerbread. We got to decorating. 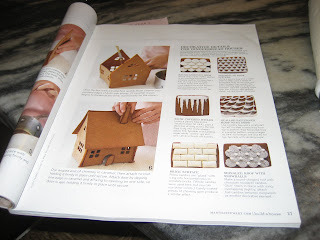 I couldn't find this page online, but here are some suggested frosting techniques. 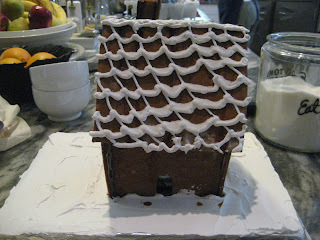 For one side of the roof I went for the "scalloped patterned roof with snow" look. Starting in on the roof. The finished product - I thought it looked pretty good! After doing one side of the roof, I turned the rest of the house over to my niece. Did I mention it was humid? We made the house on Thursday morning and by Thursday night it looked like this. I then realized that Martha lives in Maine... and what works in Maine in freezing weather might not work so well in humid Louisiana. 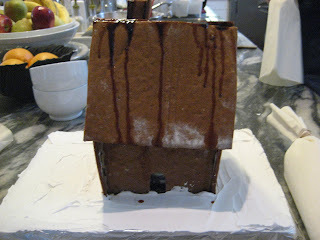 Our gingerbread house looks like it was hit by Katrina! 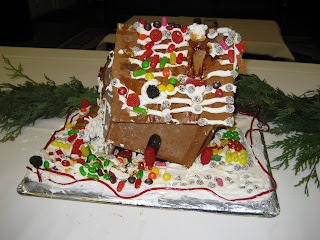 For reference, here is what our gingerbread houses usually look like - smaller, but able to withstand the elements a little better! 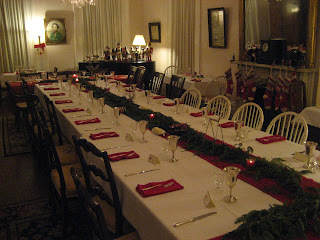 Scenes from this year's Christmas - seating for 46! I still don't know how it all comes together, but it always does! Merry Christmas to all! This year, my work team went out to a holiday dinner at Manresa in Los Gatos, CA. It was so good (the restaurant has two Michelin stars)! I took these photos for Brandi who, despite organizing it, had to miss it because she was sick! 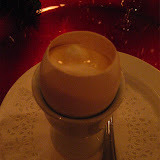 It was four courses with wine pairings (and a little amuse bouche egg dish). Pretty good! Stockings by the fire (tv)? check. Reindeer antlers and candy canes? check. 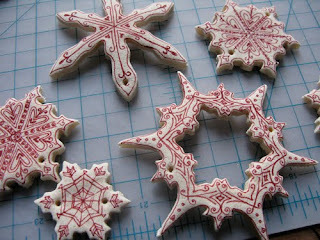 Every year Alison hosts a cookie decorating party - that I always manage to miss! Anyway, this year she sent me photos of some adorable cupcakes that she actually made the next morning with the leftover ingredients and toppings! She got her pan at Williams Sonoma, but since they no longer carry it - you can find it at Amazon. Ice cream cone cup cakes - very clever! 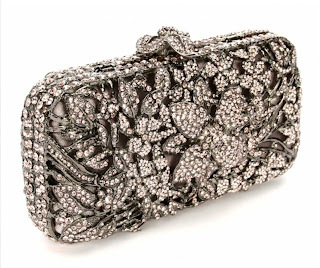 Usually I am more of a shoe person, but this clutch is insanely beautiful. It would be gorgeous as something to use on your wedding day. 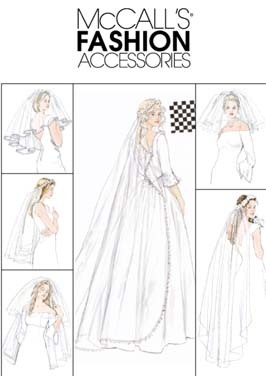 There is something very feminine and delicate about it. Heaven! and Mrs. Reindeer (she was bored). p.s. Reindeer are the only member of the deer family where the female also grows antlers (learned that from the reindeer handler). For the past few years, I have embraced my mom's tradition of making sherried pecans for friends, neighbors, and coworkers. This year my fiance and I got to business with several pounds of pecans, sherry, sugar, a candy thermometer, and other mysterious spices (some recipes online use butter - not this one). We bagged them up and then distributed them (well some of them have been distributed - others will get them after Christmas). Oops! 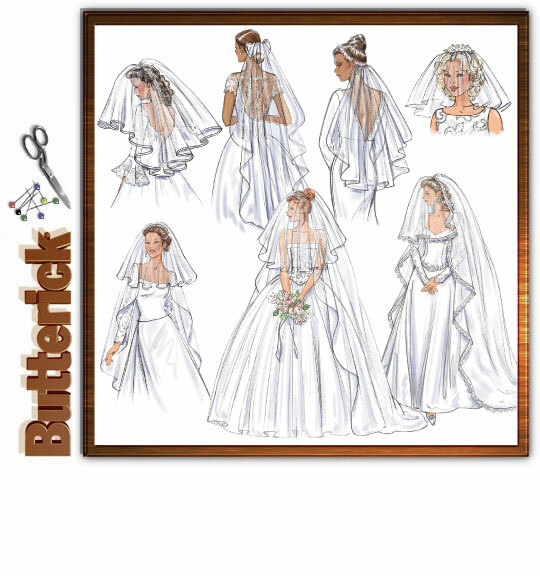 Bad planning on my part... lots of work getting in the way. Anyway, they are good for a long time and will still taste good in January (it's the thought that counts right)?! Something tells me that I shouldn't like this song, but I can't help it! Along with Mariah Carey "All I want for Christmas is You" it is one of my top favorites! "maybe just a half a drink more..."
"put some records on while I pour..."
A friend of a friend made flakemaker.com - virtual craftiness! 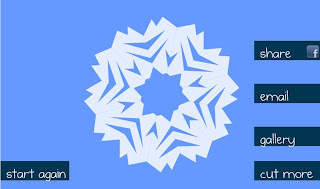 It was surprisingly fun - although if you look at the gallery, my flake doesn't stand a chance! On December 14th, 1996 - Elizabeth, Sara, and I were at the Riverwalk mall shopping and buying Christmas gifts. While Elizabeth and I were in the Gap dressing room (Sara had gone down the hall to the Cafe Du Monde), the building started shaking and things started to feel really wrong. "New Orleans isn't on a fault line" was my first thought. 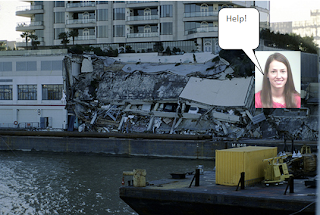 At the time we didn't know that a huge (HUGE) container freight called The Bright Field was side-swiping the building. Only in New Orleans would be you in a Mall that was hit by a boat. The Gap was to the right of the photo below (image courtesy of John Z.). Luckily (miraculously), no one died in the accident. The Gap store room and dressing rooms would eventually fall into the water and at first people mistook the mannequins for people. Most injuries came from the people jumping off the docked Casino boat - directly in the path of the boat (it stopped before it got there). However, it was a pretty scary experience and to this day I still jump a mile high when rooms shake (often because there is heavy truck rolling by). I don't know why I live in the land of Earthquakes! I almost didn't apply to schools out here because of it... my mom had to convinced me! So why did it happen? A loss of engine power at a critical turn in the river. The Coast Guard and NTSB later attributed this loss of power to poorly maintained oil filter. 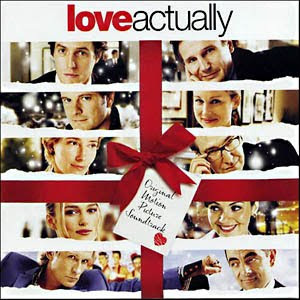 My favorite holiday movie is Love Actually - I watch it at least once every year. I have also recently watched National Lampoon's Christmas Vacation. What is your favorite holiday movie? "Creativity is as important in education as literacy." "Kids will take chance. If they don't know, they'll have a go. Am I right? They're not frightened of being wrong. Now I don't mean to say that being wrong is the same thing as being creative. But what we do know, is that if you are not prepared to be wrong - you'll never come up with anything original. If you're not prepared to be wrong. And by the time they get to be adults, most kids have lost that capacity. They have become frightened of being wrong." "We are educating people out of their creative capacities." Right now I am obsessed with the song "True Affection" by The Blow. I also just realized that I could embed songs into a blog post! I discover most new music via my Pandora stations. Lately I have been listening to my Regina Spektor station - although I think I am going to switch to Christmas music for the rest of December (Mariah Carey - "All I want for Christmas is you" station). The picture isn't great, but how cute is this mobile? It is hanging in my home office and I am obsessed with it. A while back Audrey was looking for a baby gift and sent me the link to PinkPerch on Etsy. I had been looking for a cool mobile for our office, although I must admit that I had mostly been looking at Modern Art Museum gift shops. Anyway, this one is perfect for the aerospace side of me - indulging the astronaut dreams of my youth (check out the writing on the side of the space shuttle - the other side says NASA). Awesome. This past week I happened to be in North Carolina - where I discovered this soda in the case called Cheerwine (around since 1917). Learning that it tasted like Cherry Coke I was intrigued. I really like Dr. Pepper, Cherry Coke, and Barq's root beer - so I wondered where this soda would fall in line. The verdict? Very good - tasted a lot like Cherry Coke. It was fun to try something new and regional. If you see it - you should definitely give it a try. I read a blog called Sea of Shoes. The blogger Jane (age 17ish) has just come back from the Crillon Ball in Paris (she lives in Dallas). 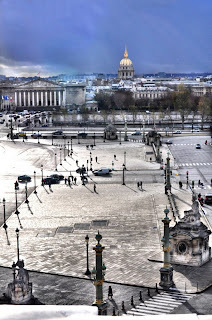 Check out the view from the Hotel de Crillon - what a beautiful photo! By the way, she was dressed for the ball by Chanel. Very lucky girl! I need to get some photo editing skills... and maybe a better camera. This photo is inspiring. Happy December! It is the month of sweet treats - from those little advent calendars with chocolates to (of course) the Nutcracker ballet. I love the Nutcracker - it always makes it feel like Christmas to go and watch a performance. Even though I have seen the Nutcracker more times than I can count, I am still enchanted by the music, the costumes, and the story. I also participated for a few years as a dancer - as a mouse and as one of the turbaned young dancers under the giant skirt. There is a great deal going for the SF Ballet - the Nutcracker Date Night performances where you can get cheap tickets, two for one champagne, and early admittance! If you have never seen it, you should definitely go - the War Memorial Opera House is a beautiful place. For those of you that have seen the ballet too many times, I think that The Hard Nut ballet would be a lot of fun to watch. 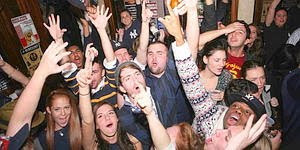 It is coming to Berkeley in December. It is a chance to laugh and see a classic ballet in a fresh way.